The Kickstarter-funded "tavern for geeks and gamers" will open in Fort Collins this spring, after it reached its initial goal of $9,600 in under 7 hours. Gamers, geeks, and cosplayers will soon have a dedicated bar in which to get hammered over Hammer of the Scots. 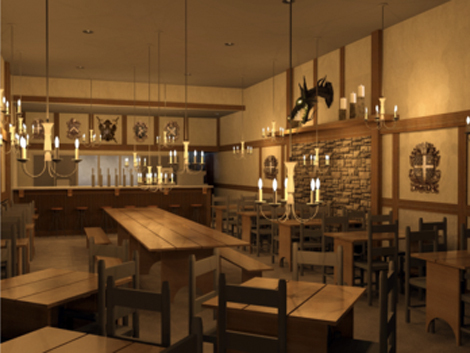 Fort Collins—the geekiest city in Colorado, according to the Kickstarter video above—will soon be the home of Dungeons & Drafts, a medieval English style tavern with an extensive library of board, card, war, and video games. The Kickstarter promises board game themed cocktails—like D&D shout-out Thyme Lord and Settlers of Catan-referencing Grain for Ore—as well as local craft beers, mead, and hard cider on tap. Drinks are available by the chalice or tankard for members of the bar’s loyalty programs, which have awesome names like the Fellowship of the Flagon. The crowdfunding campaign is pretty game-like itself, with multiple stretch goals unlocking new levels and 25 different tiers for backers to choose from. Rewards are suitably geeky, like custom painted game miniatures or a 20-sided die which can be used for drinking games, because, duh. At the upper levels things get even better: The $200 Monarch package includes a name plaque above one of the bathroom thrones, for $750 you can help create and name the bar’s exclusive Black Bottle Brewery beer, and for $1000 you will be immortalized in a 5-foot panel of faux stained glass (as an elf warrior, warlock or other character of your choosing, naturally). 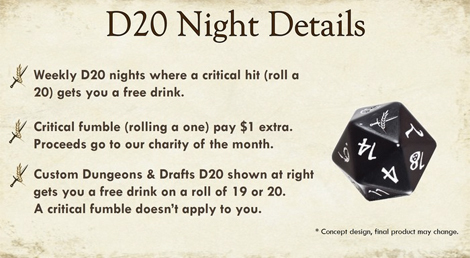 With rewards like that it’s no surprise that Dungeons & Drafts reached its initial goal of $9,600 in under 7 hours. It has since surpassed the first of three stretch goals and is fast closing in on the $30,000 mark, which will result in “more geeky ambience” like wooden crockery and communal fire pits. Head to the Kickstarter page if you want to help push it over the edge and create a bar where everybody knows your name—because it’s written on a plaque above the toilet. 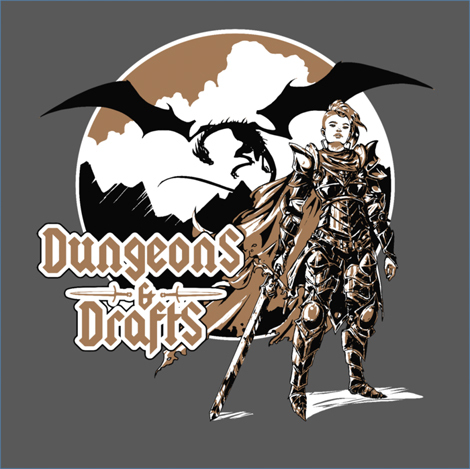 The official Dungeons & Drafts Tshirt design.